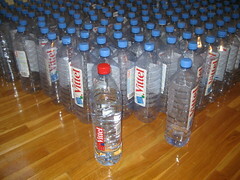 And that is extremely painful when I’ve got a collection of Vittel bottles! Now as collection is finalized, I’m forced to make some decision with future of this army (>200 units ;-) Hell! r.r…. build a raft ye! :D that will rock ! Or should the R word not be mentioned? Ir koki gi suda tu brolau geri? Ismesk sitas siuksles ir nusipirk alaus! You could melt them with a blowtorch and make some kind of art. Very creative, would probably get you some kind of award.